Yesterday I happily threw around figures about what we’d spent on food, but didn’t get the chance to post the pics in all their technicolour glory. So given I have been dutifully lining up my shopping on the kitchen table to preserve for posterity, here’s the update. In the first week of February, I racked up food bills for £60.12 in just 4 days as posted here, but that still wasn’t the end. On the Friday, my husband stopped off at Sainsbury’s for petrol, so I asked him to pick up some toiletries and store cupboard staples in the hope of winning gazillions of Nectar points on some Nectar promotion. 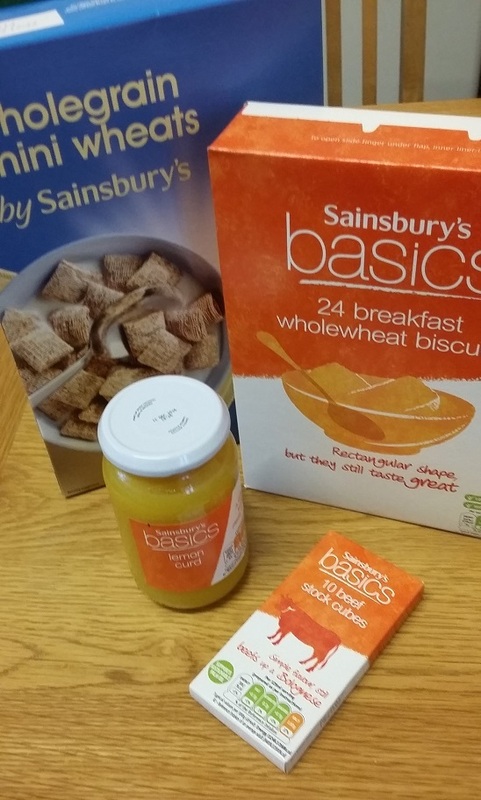 The food came to a not overly extravagant £3.50 (Basics beef stock cubes, Basics lemon curd, Basics version of Weetabix and Sainsbury’s version of mini shredded wheats). We did win some Nectar points – a whole 200. Swizz. This is worth a pound’s worth of Sainsbury’s shopping. There go my dreams of early retirement. 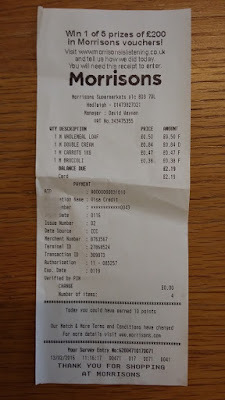 We went away for the weekend, and bought some sausage rolls during our drive back (£2.70, wolfed down before they got anywhere near a camera) and my husband also bought a couple of big bottles of milk when he went out for the paper (£2.23). 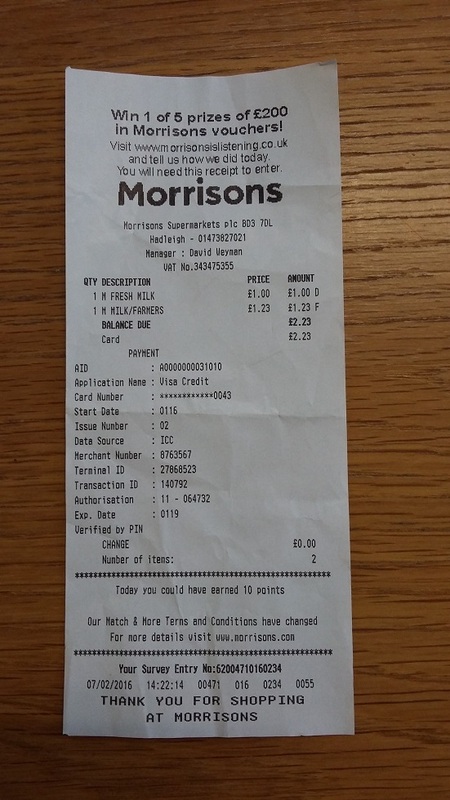 £2.23 milk receipt, as we’ve drunk the bottles. 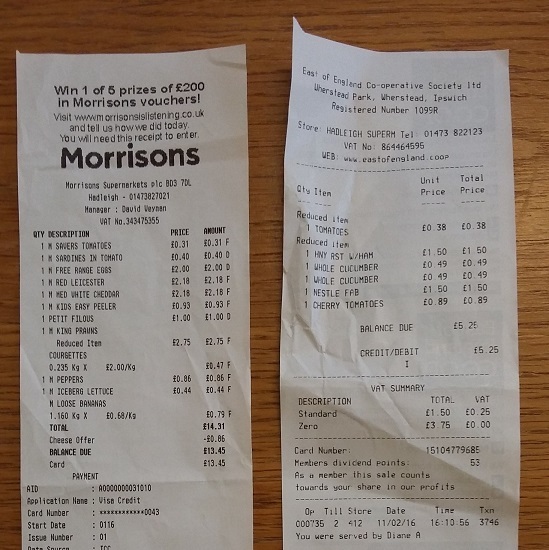 So kerching, the final total for the first week of February was a not-entirely-frugal £68.55. 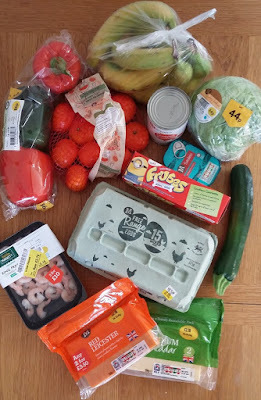 During week 2, I tried to shop specifically for that week’s meals, rather than worrying about what else we had run out of. In practice, I couldn’t resist picking up the odd yellow-stickered bargain. I held out until Tuesday evening for any top up shopping, and then stuck to fresh fruit, veg and dairy products, plus some eggs and a tin of sardines. I hesistated over the reduced-price pack of king prawns, with 215g for £2.75, and caved in on the basis they’d be great in a curry or stir fry. I also found myself hesitating in front of the cheese shelves, poised to pick up a small pack of cheese just to keep the total shopping bill lower. In the end I came to my senses, and bought two larger packs on offer. The bigger quantity cost less per kilo, and we’ll definitely eat it all, so the smaller size seemed a false economy. 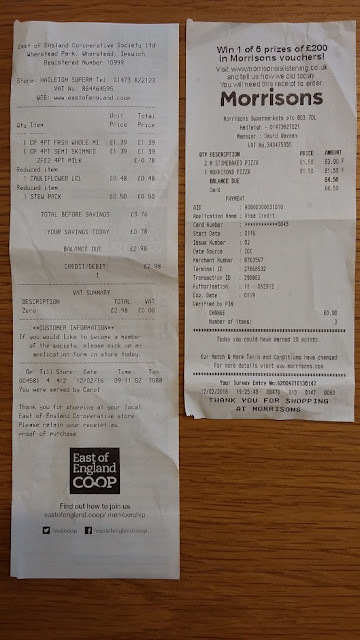 £13.45 for restrained top up shopping. Friday started well, when I went via the Co-op for milk and came away with some cut price veg. 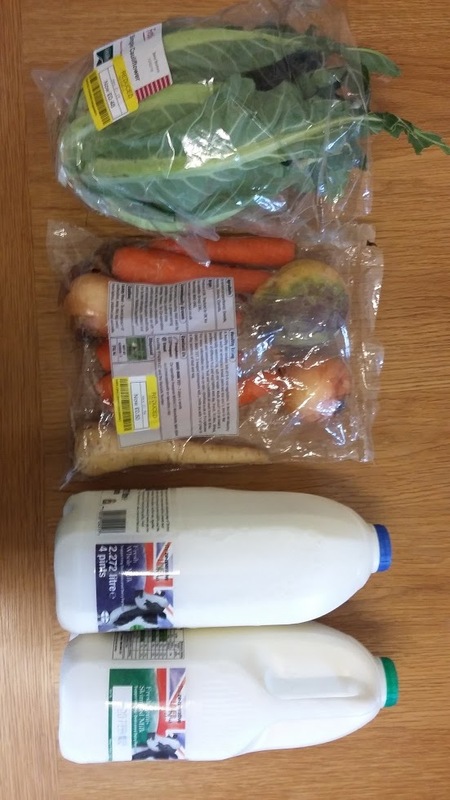 The locally-sourced cauliflower was reduced to 48p and the kilo stew pack of onions, carrots, swede and parsnip was only 50p (kerching, £2.98). But by the end of a difficult day, all my best plans for making large quantities of home-made pizza dough went out of the window. 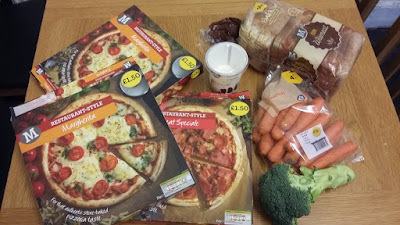 My husband ended up on an emergency run for supermarket pizzas, although we opted to add extra toppings to three frozen versions for £4.50, rather than fork out three times as much at the pizza counter. The small shopping trips during Week 2 all added up to £28.37, so a lot less than the first week. 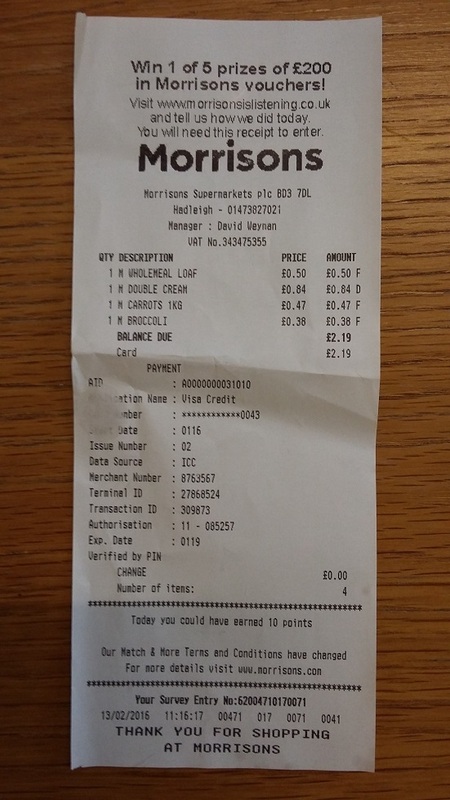 Over the two weeks, the food spending for our family of four averages out at just under £49 a week, so we have managed to spend less than January’s £60 a week so far. Onwards and upwards into Week 3! Wish me luck, it’s half term. You hit the nail on the head with my problem – buying what's on the plan for the week ahead, not buying things I know we've run out of or stocks are low. It took me a ridiculously long time to work out that not buying more is the way to use up the things lurking in the pantry. When I did the storecupboard challenge last June, it really made me realise that if I'm busy using up fresh stuff before it goes off, I don't get round to raiding the store cupboards and freezer. Thanks for the link, that's really interesting. We're also still eating up stocks – although I have to confess to buying lots of yellow stickered meat the other day. However, our freezers have some room in (lots in the small one in the garage – I'm hoping to empty it soon) and our stocks of tins/ dried goods etc ARE going down, albeit slowly. I tried not to buy too many treat-y things for half term (all 6 of us at home, couple of days out, sleepover for 5 of DD's friends) and today I've made some rocky road type stuff (throwing in the dusty ends of two packs of cereal into the mix, along with the broken bits from the bottom of the biscuit barrel) and later will make cherry/ coconut/ banana cakes or flapjacks (undecided at the mo) and mega choc cookies with the smallest two. Some will be frozen towards lunchboxes next week. 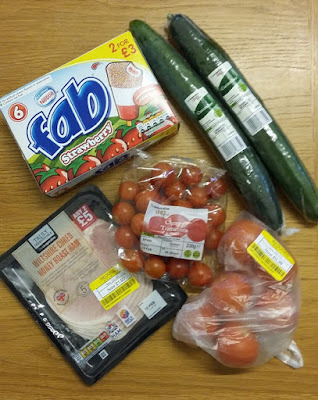 I've not had to buy anything extra for any of those, so it's using some baking bits up 🙂 My main priority for the next couple of days, though, is making sure that we eat/ freeze anything in the fridge and fruit and veggies around. A whole bag of clems has gone off with two members of the family for snacks for a car journey and I've peeled and sliced longways half a bag of carrots (bought by my mum yellow stickered back in mid Jan) to roast off with the half a butternut squash left from Sunday lunch and some parsnips from the freezer to have for dinner tonight. Bananas for snacks for 3 of us today will see those gone and that mainly leaves me more carrots, half a bag of spinach, 1 1/2 cucumbers, lots of apples, mushrooms and tomatoes, 2 little gem lettuces, 2 peppers and 2 oranges to get through…… (Am not including the potatoes, cooking apples and onions, as they'll all definitely last over into next week/ beyond) Sigh……. I find that school hols can mean that I over buy fruits and veggies, as what would normally get used in lunchboxes for 4/ 5 every weekday gets overlooked in favour of more fun things to have at home instead…. Always distressing when you have to throw away what was perfectly good fruit and veg. Good luck using or freezing it, and good luck with surviving half term! Your baking sounds delicious too.